From Renditions: Wrote both poetry and prose, but is better known as an essay-writer than a poet. 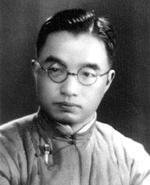 He was educated at Peking University and appointed professor of Chinese literature at Qinghua University in 1925. In 1931-32 he studied English literature and linguistics in London. Active early as a poet, he is best known for the long poem "Huimie" [Destruction]. His collections of prose include Beiying [Retreating figure] and Ni wo [You I].